The Day of Sai Herthe falls on Herthe 6th/December 31st – New Year's Eve in the Gregorian Calendar and the Seventh Day of Nativity. It is sometimes called the Day of Hestia. What exactly is the Day of Sai Herthe? The Day of Sai Herthe is the festival of the hearth-fire. Thus, by extension, it is the festival of the home, or Hestia. The Hestia is the center of life in feminine tradition. It is no accident that we say our home is "where we live", even though from early times patriarchy has continually emphasized the public world, or Agora, as "what is most important". We see this today in the belief in "the primacy of politics" as the most important thing. Nevertheless the home continues to be "where we live". In feminine cultures society as a whole is seen as an extended household. And when the society is Agora-ized and religion patriarchalized, the home becomes the center of faith and worship for the religion of Our Mother God. The cardinal moment of this festival is midnight on Herthe 6th/December 31st – the same as with New Year's Day. For New Year's Day, the significance is clear – it is the transition point between the years in a calendar that begins days at midnight (the Filianic calendar begins days at dawn). What is the significance of midnight for the Day of Herthe? Each of the cardinal points of the year corresponds to a cardinal point of the day, so the Spring Equinox (Eastre) is dawn, the Summer Solstice (Rosa Mundi) is midday, the Autumn Equinox (Feast of Divine Life) is dusk and the Winter Solstice (Nativity) is midnight. The Day of Herthe is very closely related to Nativity. It is, indeed, the Seventh Day of Nativity, so it shares some of the very fundamental symbolism of that Festival. Nativity is the Northern (or Midnight) gate of the year through which the Divine can enter the world. One symbolism of this is the Star Fairy entering the house (a microcosm of the cosmos) through its vertical opening, the chimney. Many traditions that are in modern Western society relegated to the world of children are in fact of profound metaphysical significance. Now the Entrance through the chimney (which is a "path" or "way" as is particularly clear in the French chemin=way or path / cheminée=chimney) and it leads from the region "above" the cosmos (symbolized by the microcosm of the house) into the very heart of the cosmos, which is the hearth-fire. Naturally this takes place at midnight. The Feast of Nativity, on the last day of the Star-month, Astraea, concentrates on the descent of the Divine into the cosmos – the Birth of God the Daughter, and also, more analogically, the entrance of the Star Fairy. The Day of Sai Herthe concentrates upon the hearth-fire itself; the heart of the home and symbolically the heart of the universe, lighted by the Divine. Most of us don't actually have a hearth-fire these days, so what should be the focal point of our celebration? "Focal point" is an interesting choice of words. Our word "focus" literally means "hearth-fire" in Latin. The focal point of the home, "where we live". Where there is no literal hearth-fire it is good to make a symbolic focal point for the home. Perhaps the family shrine. Or, if you are celebrating the festival quietly in a larger household of non-believers, your personal shrine. 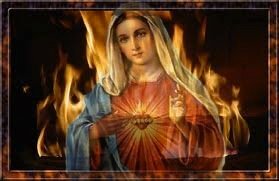 You should visualize this as the center of your personal hestia, where the divine influence enters from above. Also this is likely to be the only place in the modern home where a living flame burns. It is good to light a candle at midnight on the Day of Sai Herthe as the symbol of the divine flame at the heart of your home. What about driving away evil spirits? Is that still an important part of the festival? Oh yes. The importance of defending against demonic forces has been known by every culture except the modern Western. It is particularly important in feminine religion. Among some traditional households this Sai Herthe's Day banishment is quite a noisy affair – running through the house banging drums, pots and pans, anything to make a loud noise and drive away bad spirits. After that the house should be sealed against their return. If you have a party of like-minded souls, by all means make the traditional noise. But if you are alone, or more quietly inclined, we recommend that you light your candle(s) and envision a great flame cleansing the house of all dark influences. Then, at each window and door make the sign of the Fora with a stick of burning incense. 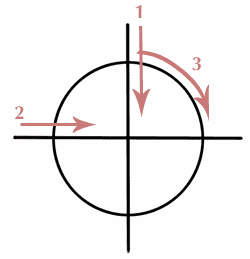 As shown in the diagram, make the first stroke downwards, visualizing the light descending from the heaven-world to the lowest domains of being. Make the second stroke horizontally from left to right, representing the plane we currently occupy (and yes, the domain of physical matter is by no means the lowest). Now make the circle, enclosing and protecting your household and yourself, which is situated at the very center. As you make the first and second strokes, visualize all demons being forced out of the window or doorway, and as you make the circle, see it sealed and protected against their return. Remember also that, just like the house, your own being is a microcosm of the world. So – especially if you have been troubled by mental/emotional difficulties or attacks from the forces of darkness – you can, and should, use the same ritual to cleanse and seal yourself. The Deanic/Filianic year actually begins at Eastre, the Spring Equinox. To what extent is the Day of Sai Herthe a "new year"? This aspect of the day is quite important. When there were Deanic temples, the hearth-fire was often put out and re-lit from the sacred Temple Flame. This was the only day that the house-flame was allowed to go out completely. So we are certainly beginning a new cycle, making a new start. We are also beginning with a clean, purified house. Why is this, when New Year is actually at Eastre? 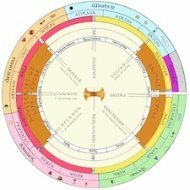 Well, in fact everyone acknowledges to some degree that a year may have more than one beginning – representing the cycle in different aspects. Birthdays, for example, are seen as the start of an individual's year, and even those who begin the year in Winter cannot help seeing the new birth of a year in Spring. These are contradictory only to a mind that is too bound up in an excluding and linear logic. Certainly the Day of Sai Herthe is, and always has been, a sort of new start. It comes at the center of the Nativity Cycle, which itself represents the coming year (the Twelve Days plus Epiphany representing the twelve months plus Moura). There are many traditions (eating a particular food for each of the Twelve Days, for example) that are supposed to bring good luck for each of the coming twelve months. So definitely this Axis of the Year is seen as initiating a new cycle. What about making resolutions on Sai Herthe's Day? Some folks do this, and if you want to make resolutions, it is not a bad idea, since Eastre is so much bound up with the Resurrection of God the Daughter that it is nice to have a more minor festival to devote to "new-yeary" things. As you know, each Filianic year is ruled by one of the seven Great Janyati and many people see the period of the year between Sai Herthe's Day and Eastre as a little bit of an interregnum in which certain aspects of next year's Janya start to be made manifest. So certainly, regard this as a New-Cycle festival, but do not forget that it centers on the Home. It is a time for sanctifying the physical house, as well as the bodily being we inhabit, cleansing and protecting them. It is a time for considering the family, Amity Group, or community of faith in which we live, if we are fortunate enough to have one. It is, above all, a time for re-kindling the Sacred Flame at the heart of "where we live". The Epiphany of Our Lady: Twelve Days after the Nativity, the Holy Daughter is shown forth to the world. The Feast of the Epiphany long predates Christianity. Learn about its beautiful meaning. How to make your own home shrine.